NLRB Rules Against Franchisers. Is It a Game Changer? Labor advocates won an administrative victory in late July, when the general counsel of the National Labor Relations Board ruled that McDonald’s should be considered a joint employer along with its franchisees—and would therefore be accountable for working conditions and practices. The ruling is subject to review by the NLRB first, and then the federal courts. If it sticks, it could turn the franchising industry on its head. Corporate headquarters who had no hand in selecting, hiring or training employees, who do not set schedules or sign paychecks, would potentially be on the hook for the actions of thousands of independent franchisees all over the country. Suddenly, all franchisers—not just the McDonald’s of the world, who perhaps have the resources and economies of scale to deal with the new level of exposure, but also the three- to 10-franchise startups you’ve never heard of who are trying to make a footprint—would have to calculate whether the risk of an employee lawsuit because of the actions of an independent franchisee thousands of miles away is worth the effort. Franchising has a long and storied history in American commerce. Indeed, it is one of the truly American institutions. The practice began in the 19th century. McCormick Harvesting Machine and the Singer Company (think sewing machines) realized that wholesalers didn’t want to be involved in direct sales, distribution or servicing. The franchise system sprang up to fill the gap. A few restaurant chains and hotels continued to develop the process in the 1930s, White Castle being a prominent early franchiser. Later, in 1954, Ray Kroc adapted the franchise model and eventually built the world’s biggest restaurant empire: McDonald’s. 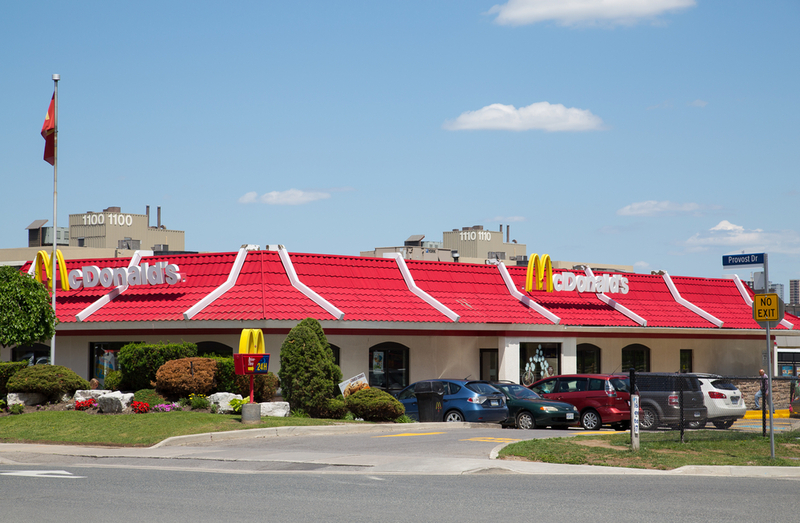 It’s been a profitable model for franchisers: McDonald’s, Yum! Brands (Taco Bell, Pizza Hut and others), Burger King, Wendy’s, Dunkin’ Donuts, Sonic and Domino’s earned a combined $7.44 billion in profits in 2012, which generated $7.7 billion in combined dividends and share buyback programs for investors, according to the National Employment Law Project. The workers aren’t making much money themselves: Their median hourly wage is $8.94. They aren’t typically teenagers living with their parents anymore, either. Well, they may still be living with their parents, but they aren’t teens: Two out of three are age 24 or older, and nearly seven out of 10 fast food workers are one of the main breadwinners in their families. Some 52% of them rely on public assistance, and employees at the 10 biggest fast food businesses receive $3.8 billion in welfare. Historically, the franchise model has placed a legal firewall between the parent company franchisers and the hourly employees working the fryers and manning the registers. These workers have not been considered to be employees of the parent company, but instead work for the store owner—the franchisee. The franchise agreement typically rents the intellectual property—the name, trademarks, recipes, operating procedures, and so on—to the franchisee. But the franchisee has been held responsible for nearly all the employment decisions at a local level, and has historically been solely responsible for compliance with labor law. According to the Employment Law Project’s research, this is a problem: Companies that embrace the franchising model, or that place various levels of subcontractors between the rank-and-file worker and the parent company, do manage to avoid a lot of direct liability for labor issues, but the contractors and franchisees tend to be undercapitalized. And it’s the workers who pay the price: 30% of fast food workers surveyed in New York report that they had paychecks bounce, or were paid late. Some 30% reported failure of their employers to pay mandated overtime, and 36% reported they had been forced to work off the clock, in violation of the law. Overall, 89% of fast food workers surveyed report having been victims of wage theft in one way or another, according to a study from Hart Research, as part of the pro-labor “Low Pay Is Not OK” campaign. On top of that, 87.7% don’t get paid sick days, which sometimes results in sick workers who can’t afford time off reporting to work and exposing fellow employees, food and customers to their illnesses. Indeed, 63% of food service workers surveyed reported having prepared food while sick. In response, labor advocates have been working for a while on chipping holes in that firewall between franchisers and rank-and-file employees. For example, the National Employment Law Project points to the fact that the McDonald’s corporate headquarters runs a website that screens job applicants for franchise owners. They also point out that McDonald’s itself has, in the past, asserted its authority to fire some employees who technically had been working for franchisees. Recently, McDonald’s, the 800-pound gorilla of the fast food franchising industry, has been targeted by seven different class action lawsuits filed in California, New York and Michigan for a series of alleged violations of wage and hour laws at the store level. Just a few weeks before the NLRB general counsel’s ruling, franchisers won a big victory in a federal circuit court decision, when it reversed a lower court’s jury finding that the owner of Craig O’s Pizza and Pastaria would be responsible for labor law violations committed by an independent Craig O’s franchise owner. Did the franchiser or upstream contractor possess the power to hire and fire employees? Does it control work schedules or conditions of employment? Does it determine the rate or method of payment? Does it maintain employment records? The court held that the plaintiff failed to show evidence that Craig O’s owner, as opposed to the franchisee, actually had the power to hire and fire the employee. Further, the plaintiff had testified in court that the franchiser did not control his rate of pay. The court ruled that the mere fact the franchiser was aware of the employee’s pay rate was not evidence that the parent company exercised control. Meanwhile, technology companies are finding a receptive audience among quick service and fast casual restaurants looking to limit their exposure to labor market risk. With Seattle leading the pack in passing a local $15 minimum wage, and pressure mounting for a minimum wage increase in Congress and in state legislatures nationwide, more and more food service companies are looking to automate more of their processes—taking them out of the hands of employees and putting them in the hands of robots. Research from Oxford University projects that there is a 92% probability that most fast food preparation and delivery will be automated over the next few decades. Momentum Machines, for example, has developed and is marketing a robot that makes burgers, right down to pickle slicing. Their machine will produce 360 hamburgers an hour. Smaller franchisers have sat up and taken notice of the NLRB general counsel’s decision, and could well be expected to scale back expansion until the situation develops further. The Craig O’s decision, however, is less well known. If the Fifth Circuit’s ruling stands, then labor advocates have an uphill battle in getting their novel employment theories adopted more broadly in the legal system. Smart franchisers will take great care to ensure that their franchise agreements and practices do not meet the “economic reality test” as used by the appeals court. In the short run, the NLRB ruling, which is getting much more play than the Fifth Circuit Court opinion, could put a crimp on franchise expansion plans. McDonald’s fell a few points immediately following the NLRB counsel’s decision. Yum! Brands (YUM) also fell slightly, from $74 to about $70 per share. Wendy’s (WEN) is also down slightly since the ruling, from $8.30 to $8.10. Burger King Worldwide (BKW) hasn’t shown much movement, but maybe because—O frabjous day! Callooh! Callay!—its chicken fries are back. McDonald’s image via mikecphoto / Shutterstock.com.